Nobody wants algae all over their aquarium plants and decorations. Icky algae blooms make your aquarium uglier and jeopardize its ecosystem. Plenty of things get rid of them, like algae magnets, algae scrapers and algaecides, but they don't address the cause, and algae just grow back. Get rid of them by actually fixing the problems that cause them to grow. While different algae thrive under different lighting conditions, too much tank light is probably contributing to algae blooms. If you have coral or critters with special needs, those come first; otherwise, don't invite algae with ideal lighting conditions. Keep the tank light on for six to eight hours tops each day. Get a timer if you forget or aren't around enough. Also, your tank shouldn't be in direct sunlight; if it is, relocate it or block the sun with a shade, towel or whatever works. Change fluorescent bulbs if they're more than 1 year old, and VHO lamps if they're more than 6 months old. Their wavelengths change over time, and are probably now ideal for the algae you have. Don't use blue light unless you need it for coral, since lots of algae like it. Algae blooms need nutrients to fuel their growth. Ammonia, nitrates and phosphate are the most common. Break out the water test kit to see if something's elevated. If one or more readings are too high, let it guide your efforts to rid your aquatic community of gross growths. Read up on how to address the specific problem you discover. If no readings are particularly high, that may mean the algae are eating the stuff. Keep in mind that an established tank shouldn't have any ammonia, but other levels naturally rise over time. A few things in particular cause most elevated nutrient problems. First, do a thorough check to make sure none of your little swimmers (or plants) have died, because decomposition gives off ammonia and other compounds algae eat. Confirm that all your equipment—filter, protein skimmer, aerator, etc.—are properly hooked up, plugged in and chugging along. Clean all the parts and trays and perform any maintenance recommended in the manuals. 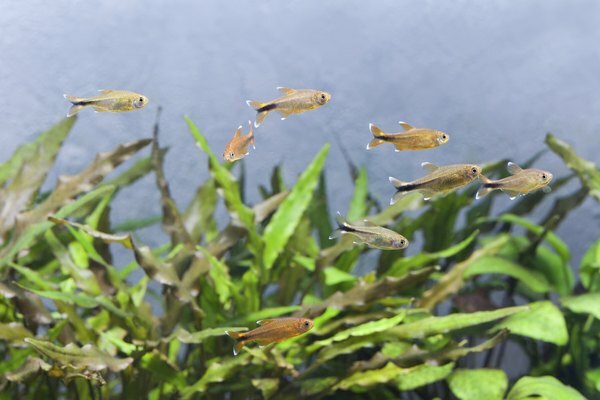 Excess food in the tank is a common problem, too, so feed your fish only once per day and only as much as they eat before they start spitting it out. Use your net and substrate vacuum often to clean out debris. Also, make sure you're not overcrowding your tank. Too many water-dwelling creatures in too small a space give off more waste than your filtration system can handle. Like all photosynthesizing life, algae love carbon dioxide. Increasing the aeration in your tank is an effective way of cutting the levels down. It also spurs the growth of aerobic bacteria, microogranisms that usually beat algae to the nutrients they both need to flourish. Good aeration also helps keep extra food, fish waste and other debris floating around so it's more likely to get cleaned or filtered out. Upgrade your aerator or add airstones to your aquarium. Also, if your tank's top doesn't provide much or any ventilation, leave it open at least part of the day. If you have a saltwater tank but no protein skimmer, get one. Assuming you have one, though, empty its tray daily; if you already do that, try getting a bigger and better model. Also, your current water temperature is likely just where the algae like it, and usually the warmer the better. If your tank life won't mind, drop the water temperature a few degrees. Do it slowly over the course of a few days, though, to avoid shocking your aquarium inhabitants. Also, don't forget your biweekly partial water changes of 10 to 15 percent of the tank water. Some people like to get algae eaters to control growths, but most of these don't eat a number of types of algae, and they also tend to stick to limited areas of the tank, almost as if they don't understand it's their job to be janitors.